Happy almost April Fool's Day! No tricks here, just the latest links and resources shared on Twitter and tagged #practicalmktr grouped here together in Practical Simple Marketing In The News. RT @wilsonellis: Responding to negative reviews increase customer loyalty http://om.ly/BPvwX #practicalmktr CB: Brilliant! How Ford blends digital with branded content - interview w Scott Kelly http://ow.ly/4ipfd #practicalmktr | kitchendsns_com Mar 21, 9:52am via web - @CBWhittemore Interesting how effective the FB Explorer was. Great article! Thanks for sharing. PS: If you like what you've read, would you consider subscribing via email or RSS to the Simple Marketing Blog? Thanks. Kinnelon, NJ – The Institute for Information Law & Policy at New York Law School has organized a half day lecture series conference entitled “Advertising & Media Law ‘Spring Rush’: Are YOU In?” on April 4th, 2011 from 2 to 5pm at New York Law School in New York City. Christine Whittemore, chief simplifier of Simple Marketing Now, has been invited to share marketplace insights. Whittemore will participate in the opening panel discussion “Getting the Most Bank Out of a Social Media Boom” and joins Jeffrey Greenbaum from Frankfurt Kurnit Klein & Selz, Michael Rubin, social media strategist, Fifth Third Bank and David Binkowski, executive vice president, digital marketing, Lippe Taylor. To attend the April 4th conference, contact Naomi Allen as soon as possible via email at naomi.allen@nyls.edu. For any visitors attending, a table will be set up in the entrance of the New York Law School (185 W. Broadway) to direct them to the event venue. Simple Marketing Now, a marketing communications consultancy, helps organizations integrate social media and content marketing with traditional marketing to better connect with customers and improve business profitability. Simple Marketing Now issues the Social Flooring Index which monitors the social state of the Flooring Industry and Flooring The Consumer about marketing to women and the retail experience. 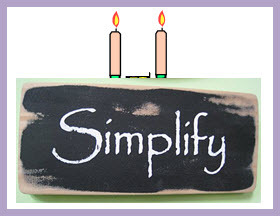 Happy Simple Marketing Blog Birthday #2! 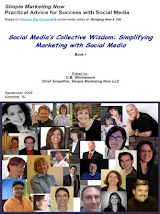 Today - March 25th, 2011 - marks the two year anniversary of this blog and of Simple Marketing Now - a milestone I find amazing! In thinking back on the past two years, I can't get over how intense the learning has been. I never imagined meeting and interacting with so many wonderful and equally passionate marketers and business people. I never imagined having as much fun exploring, creating, discovering and trying new ideas and approaches. And I never imagined how rewarding it would be to guide others who believe equally in the power of social media and content marketing. I'm ready for year three! Are you? Thank you, dear readers and subscribers, for being part of this journey. 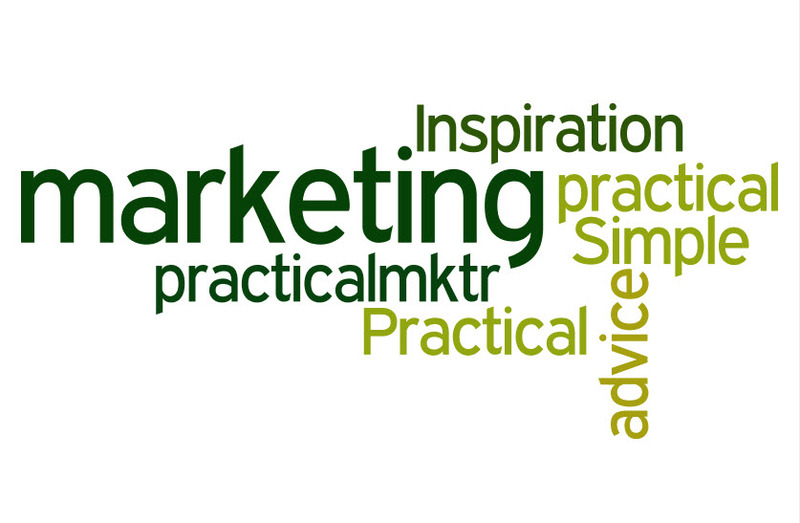 Long live Practical and Simple Marketing! P.S. : Today is also my Dad's 92nd Birthday. How Do I Increase My Followers? 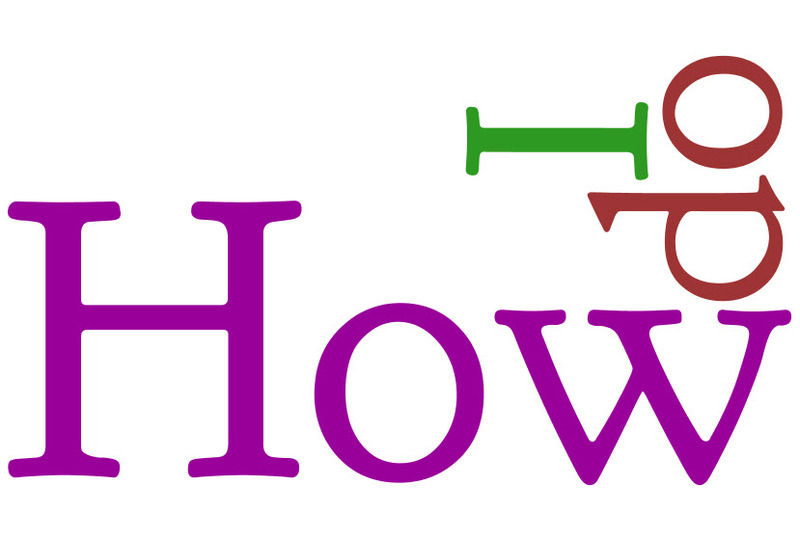 A question that comes up frequently is "How do I increase my followers or fans or subscribers?" Several people asked that question during my MarketingProfs online seminar on How to Manage Your Reputation in a Social World as well as during my Coverings 2011 presentations. The easy answer is that you can increase the number of followers, fans and subscribers by engaging with them. Say thank you; get to know them; acknowledge them; be respectful; offer them content that addresses questions they have about your product or service. Imagine if your fans, followers and subscribers came by your office, store or home. Wouldn't you greet them and invite them in for conversation? It's the same online. At the same time, I caution against 'get rich quick' schemes that guarantee you 1000s of followers and fans overnight. The result of such a strategy may be good for your ego, but it will not deliver quality of interaction, the possibility of building credibility online and the opportunity to establish long term business relationships over the long haul. It will, however, offer you considerable spam and irrelevant messages. Much better to build your base of fans, followers and subscribers consistently over time as a result of exchanging value and meaning. Given the relevance of the topic, I thought it would be valuable to share with you other perspectives on how to increase your followers, fans and subscribers. Mitch Joel recommends being active in other communities first. Mark Schaefer suggests writing insanely great content. Mark Robertson recommends that you answer questions for your audience. Danny Brown says to offer real value. Mike McGrail recommends that you be there for your readers. Deb Ng says to say something new. Gini Dietrich states make your readers feel good. Fransisco Rosales suggests respecting your audience. Stanford Smith says to focus on evergreen content. Tom Webster recommends that you know your goals and stick to them. Lee Odden urges that you deliver as promised. Jay Dolan states that you should give each reader opportunities to interact with you. Jason Keath says to ask for subscriptions at the end of your article. Mack Collier recommends placing your subscriber box at the top. Ricardo Bueno urges that you offer a benefit. Kristi Hines recommends letting people follow you in the way they prefer. As it relates to Facebook, this article titled Promote Your Business With Facebook - Effective Strategies will offer you good ideas. What have you found most effective for increasing your fans, followers and subscribers? Thanks for reading. If you liked this post, please consider subscribing! As I promised in BRITE Conference 2011: Highlights, here are my notes from Steve Rubel's presentation on the 11 Digital Trends to Watch in 2011. Attentionomics – Marketers begin to realize the value of attention and not just reach in driving conversion. Attention becomes gold as we are time constrained and on the receiving end of too much input. Let's face it, reach is an empty metric. Better to go where the conversation is taking place. Visuals are underutilized. Best to leverage data and utility. "Scale your surfaces with digital embassies." Think about day parts and when is best to engage with customers. See Rubel's Attentionomics: Captivating Attention int he Age of Content Decay for additional perspective on this trend. Digital Curation – The plethora of content will give rise to digital curators who can separate art from junk. I personally love the notion of digital curation and consider it powerful for those with knowledge. It's an opportunity to separate the art from the junk. Every brand can become a curator and own a specific knowledge zone. Editorializing, framing the issue, makes it collaborative and social. Transmedia Storytelling – If there’s one constant it’s that humans crave stories. Technology creates new expectations. Yes. Humans love stories. Narratives are being consumed in less linear and more disconnected ways [e.g., Twitter via links and Facebook via video and pictures]. Therefore, help readers connect the dots. Let employees tell stories. Encourage handcrafted content for each venue. Example: Zappos. Thought Leadership – Companies recognize they must activate credible individual expert voices who can create content. Companies that propagate new ideas generate trust. They engage in meaningful conversation. Therefore, build expert hub for internal subject matter experts; equip them with the tools to tell stories and fan them out across a cloverleaf of media. The Integration Economy – Social media efforts can no longer exist in fragmented, non-formal initiatives. They begin to integrate. Therefore, make social media a part of everyone's job. Increase collaboration across departments. Start listening; consider centralizing listening. Integrate, share intelligence across enterprises. Modify existing process and protocols so you can be ready to go. Ubiquitous Social Computing – As competition heats up mobile devices, consumers closer to being socially connected anywhere. We will absolutely connect everywhere! We will become less dependent on PCs and more on mobile as we 'untether'. Therefore, design for digital distribution. Plan for multiple digital experiences and platforms. Optimize for mobility. Combine social sharing integration. Location, Location, Facebook – If 2010 belonged to solely Foursquare, it’s likely that Facebook will rain on their parade in 2011. Facebook is well positioned to make location successful. Local, social, photo and mobile are being included in everything! Combine real and digital; reward with status. Social Media Schizophrenia – Social overload is no longer a problem for tech mavens, but a broader population. Overload is real and more average users will experience it. Let people self select which tools they will engage with. Make social participation effortless! Do big platforms well. Keep it simple! Google Strikes Back – Google proves that the best way to beat Facebook & Twitter is to do what they do best: index them to pieces. Therefore, integrate paid, earned, owned and social. Go beyond keywords to think visibility. Focus on producing regional, relevant, high quality content. Viva La Social Web Site – Businesses realize that integrating social functionality into their existing web sites is what users now expect. Explain benefits in human language. Bring social into website and website into social. Which trends do you consider most relevant to your business? 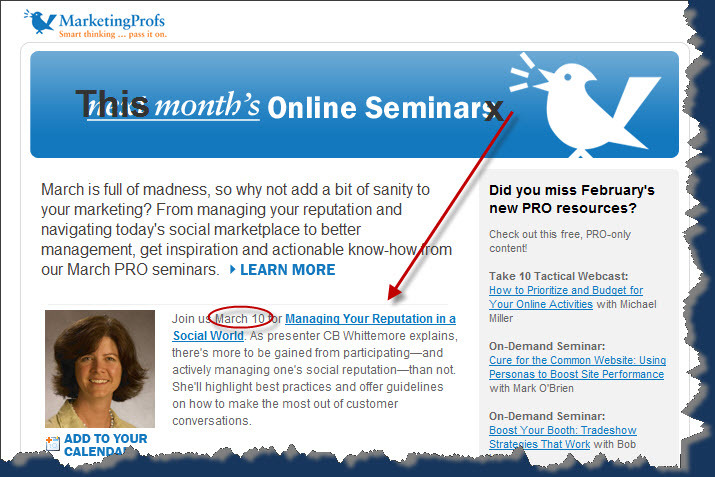 I can't thank you enough for making my inaugural MarketingProfs online seminar titled "Managing Your Reputation in a Social World" so successful! I was blown away by the enthusiasm that seminar participants expressed in the online chat as well as the #MProfsPRO Twitter chat and thoroughly enjoyed the questions - not to mention the awesome feedback! Several similar questions have come up this week during my Coverings seminars and I plan to address them in a separate post. Special thanks to my friends at MarketingProfs - Kathy Bushman, Anne Schweitzer and Valerie Witt - for their expert guidance. If you missed the presentation you can still experience it via the seminar recording of Managing Your Reputation in a Social World. Be sure to listen through to the end since the Q&A session conversation was lively. I consider the topic of reputation management fascinating - not to mention hugely relevant - and thought I would recap here the links that I shared in my presentation. I referred several times to the Socialnomics Social Media Revolution Refresh video. It's packed with good data and perspective, not least of which is a reference to Dale Carnegie who, as far back as 1936 with his bestseller How To Win Friends and Influence People , urged us to "listen first, sell second." Check out the Real-time marketing and PR webinar by the wonderful David Meerman Scott. I love these charts from Hubspot: Study Shows Small Businesses That Blog Get 55% More Website Visitors. Don't miss The Break Up. I'm amazed that this was released in 2007 and yet remains so relevant. Fiskateers: Fiskars: 360 Years Young & Innovating with Customers and CMO 2.0 Conversation About The Fiskateers. From AdAge: Listen Up! Six Things You Need to Know About Social Listening. Note references to listening for intelligence, customer service and action. 'I Hate My Room," The Traveler Tweeted. Ka-Boom! An Upgrade! Negative Reviews Aren't All Bad! 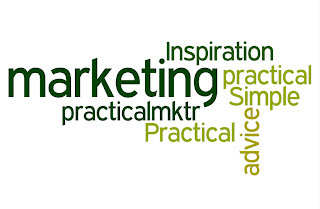 I'm off to Coverings 2011 and thought you would enjoy a less intensely packed issue of links and resources tagged #practicalmktr relating to Practical Simple Marketing In The News. The BRITE 2011 conference is over and, once again, delivered intellectually, creatively and socially while exploring the theme of Transparency as it relates to brands, innovation and technology. BRITE presenters shared their interpretation of transparency across a wide range of businesses, integrated across communication media, made relevant locally and globally, and applied to customers as well as employees. Here are my BRITE Conference highlights. Large corporations are internalizing social principles and marketing differently. VISA - Antonio Lucio, global chief marketing officer described how, over a two year period, coinciding with the company going public, the company transformed itself to think audience first, guided by social media principles of sharing, participation and recommendation, activated via a combination of paid, owned and shared media. Antonio discussed the new path to customer transactions, from funnel to loyalty loop across many touch points, with an army of advocates. Sharing is the new giving. Participation is the new consumption. Recommendation is the new advertising. He emphasized that the new 'media play' needed to include paid, owned and shared media. In other words, integrating traditional advertising with VISA owned communications and social media opportunities helped strengthen the loyalty loop. Domino's Pizza - Russell Weiner, chief marketing officer, shared the story of Radical Authenticity and the Domino's pizza turnaround. Having accepted pizza eaters' dismal feedback, the company decided to reinvent their pizza from the crust up and tell the truth [i.e., it wasn't just 'new and improved'] in a compelling and authentic way. 1. Aired an honest ad: "We listened to our toughest critics; they inspired us to reinvent our pizza from the crust up." Added live Twitter feed to home page; included long form video to further detail the story. Note: used documentary style film maker. 2. Ad based on having focus group participants try the new pizza. Posted the entire video online so viewers could see for themselves that the footage was authentic. 3. Found consumers who had never tried Domino's. Held an online competition to identify Domino's Pizza holdouts [e.g., Scott Schoyer]. 4. Show us your pizza invited customers to upload their own photos of Domino's Pizza. This was in contrast to normal product photo practice which had little to do with fresh pizza. 5. Show us your problems. Send photos of poor looking pizza or delivery issues. Listen and do something about what you learn. Very important to report back to detractors on changes made. Show response. Russell detailed strong results, financially and for taste and satisfaction. You may find these articles relevant: Domino's Pizza Profit, Sales Keep Rising and Domino's adds new chicken options to its revamped menu. FedEx - Renee Horne, director digital and social media engagement, explained how, as FedEx has shifted investments from traditional paid media to owned and earned media sources, it has embraced social media most visibly via the IamFedex.com program whereby Fedex employees tell their story. FedEx has noticed how customers are engaging through social networks and are much more likely to trust conversations taking place on earned sources [i.e., on social platforms]. This is a critical point! In the 1980s, FedEx relied on broadcast networks to communicate in a linear model. That model has become irrelevant. The new model is about dialog with customers. The role of the marketer has evolved, as has that of company employees. Employees are now brand ambassadors who generate creative ideas [i.e., content] for reaching out to and engaging with customers. Hence, IamFedex.com where 275k FedEx employees from around the world, in a multitude of languages, celebrate their personal stories. Tim Maleeny from Ogilvy described the Big IdeaL, for brands with a higher purpose focused not on transient share-of-mind ideas, but rather share-of-culture ideals. Hank Cardello, author of Stuffed: An Insider's Look at Who's (Really) Making America Fat , addressed health as a business strategy through which businesses can improve performance metrics, strengthen customer loyalty and develop a competitive advantage. 38% of adults [i.e., 86 million people] demand responsibility and are using purchases to influence corporations. Walmart refers to taking stewardship over customer's well-being. Think of it as "cuddle capitalism". Carol Cone from Edelman Citizenship shared intense passion for "the power of purpose in a transparent world" and the need for Capitalism to have a human face given the all time low recent Trust Barometer results. 86% of consumers say that business must align performance with social concerns; 62% will switch if a company doesn't. Many corporations are changing their mission to include performance with a purpose. Having a purpose benefits businesses. It creates a difference; leads to innovation, growth and sales; it builds and protects reputation and it engages customers and employees. Purpose fuels growth and it evolves. To be authentic, though, it's important to pick the issue first, identify credible best partners and then consistently support the issue. Mobile barcodes bridge online and offline. They serve up a message [some retailers include scanner with their mobile applications]. Location based messaging: SMS combined with location becomes more relevant to customers. Imagine having a geofence around stores and, if you've opted in, you can receive relevant messages from retailers when you cross the fence. Luke described 2004 research by Richard Nisbitt about how culture affects our thinking. He analysed what students from the West and Asia paid attention to when looking at the same images. The Westerners looked at the foreground whereas the Asians focused on the environment/context. Conclusion: Westerners were change blind suggesting a type of myopia when focused on brand-building and technology [e.g., think Apple]. The need for disruptive innovation becomes critical when brands focus on giving consumers what they expect plus more. At some point - have you tried to simply pick out a tube of toothpaste lately? what do all of those options mean? - nothing stands out for customers. Disruptive innovation isn't about technology; that is myopic. Better to focus instead on behavior revolution [e.g., the Internet aka MP3 generation has a different frame of reference and values for speed, convenience and quality]. Changes in consumer behavior trigger a need for new brand thinking. Look at brand conventions and mix them all up. Break free. See the new. Be unpredictable. 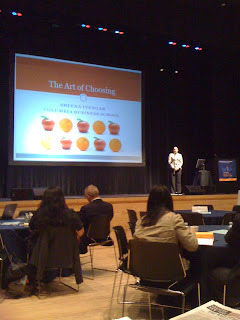 Steve Rubel, senior vice president, director of insights, Edelman Digital, presented the Eleven Digital Trends to Watch in 2011. I'll cover those in a separate post. Sheryl Roth Rogers, chief marketing officer of Mom Central Consulting, in a discussion about social commerce, focused on the art of influence and activating moms on behalf of brands. Brands building relations with customers represents a paradigm shift. Traditional brand building focuses on ROI, targeted impressions and CPM which Sheryl equated to counting frogs and raindrops in the rainforest. Social media marketing focuses on spheres of influence and many small circles of influence coming together, people talking to each other and becoming passionate enthusiasts. Brands need to understand the tapestry of brand engagement associated with social media and social commerce. Social commerce is here to stay. If done properly, it's effective to sell with a social approach. It's critical to be customer focused particularly in executing the product experience. It's important to integrate across all customer touch points. Tailor the experience into snack bites depending on how customers consume information. Be ready for increased levels of transparency. Frank Eliason, formerly with Comcast and now with Citi, focused on the human side of brands. At Comcast, he proactively engaged with detractors and they responded passionately; he brought multiple service areas together to better respond to customers. It's critical to be very human and have an individual identity. No one wants to interact with brands! People do want to interact with human beings. He sees his role within Citi as trying to be disruptive in reminding people about the customer perspective. The customer controls the message; we all read reviews written by other customers before buying. Bad conversations happen; it's better to know about them so you can do something about them. Customer service is the new PR and the new marketing. It's about person to person interaction with customers. Josh Millrod/Jason Clement from Weiden + Kennedy [whose mission is "to create strong and provocative relationships between good companies"] described how to socialize brands and activate digital communities. Mind you, they are behind Old Spice and Isaiah Mustafa. Socializing is the antithesis of traditional advertisting: "you can't socialize with 1 million people at once." Furthermore, "scale isn't always achieved by creating something that appeals to the largest number of people" [I find this concept fascinating]. Examples include Wheat Thins pallet, Lufthansa Beer Garden and Lil B "cooking dance". Old Spice represents a traditional advertising concept. The challenge was figuring out how to make it more social. Solution: have Mustafa respond to individuals! Don't rely on an army of interns. Appeal to the masses by creating for a few. Inspire others to host the conversation for the brand. This requires that you find what the truth is about your brand. Sheena Iyengar, Columbia Business School professor and author of The Art of Choosing , discussed choice and how to create a mutually beneficial relationship as a result of the choices we offer customers [i.e., choice for benefit rather than to trick]. Three negative consequences come from too many choices: commitment [it's easier to delay choices], make worse choices [the decision quality decreases] and satisfaction diminishes. "Our eyes are too big for our mind" as well as our stomach. When are we better off when we have more choices? It depends on the level of experience in the choosing domains. A chess master thinks 8 moves ahead and considers an infinite number of options. However, s/he sees the chess board as patterns and can therefore zero in on the best, most relevant options. 1. Cut: careful trimming can increase sales and improve profitability. It eliminates redundant options. 2. Categorize. Experts do this; very helpful for novices. Best Cellars does this effectively for wine, grouping them into 8 categories, with more information within each category. Be useful to the chooser, not the creator of the category. 3. Condition for Complexity. Need a methodical approach to having lots of choices. If you start with deep to shallow options, customers are less likely to engage; you lose them. However, if you start with shallow questions and proceed to more involved options, customers are more likely to hang in and satisfaction with their choice increases. Talk about a lot of valuable insights! Be sure to check out Brad Jobling's BRITE Conference 2011 Highlights. Too BRITE – or – back to the office I go! 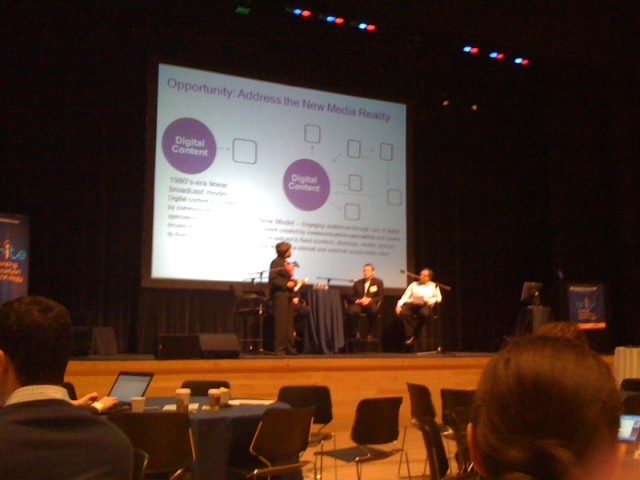 Here is a link to the Twitter transcript for #BriteConf for March 2 through 4, 2011. On the social side, I had the opportunity to meet for the first time in person Frank Eliason, BL Ochman and Denise Lee Yohn and get caught up with David Polinchock, Brad Jobling, Tom Guarriello [you might enjoy Tom Guarriello On Bridging New & Old: Social Media Series] and Anne Mai Bertelsen. 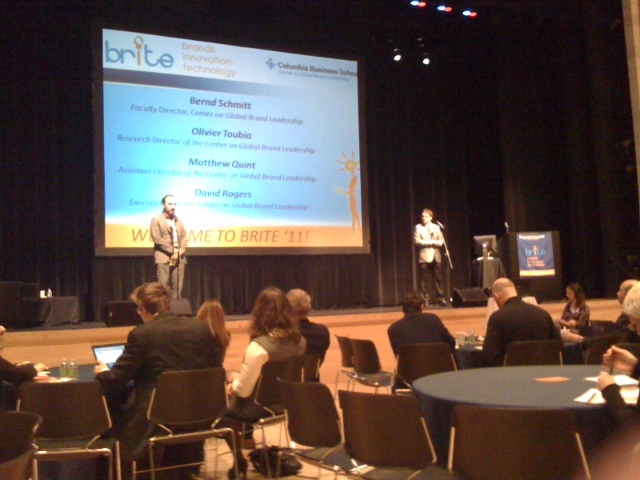 Did you attend or follow BRITE Conference? What were your highlights? Press Release: Concerned About Managing Your Company's Reputation in a Social World? Concerned About How To Manage Your Company’s Reputation in a Social World? Kinnelon, NJ – MarketingProfs presents “Managing Your Reputation in a Social World” to explore how to make the most out of digital customer interactions. The online seminar, led by Christine B. Whittemore, chief simplifier of Simple Marketing Now LLC, takes place March 10, 2011 from 12pm to 1:30pm EST. Whittemore has been immersed in social media since 2006 – personally, for a brand and for her business. She is the author of Flooring The Consumer – a highly acclaimed weblog about the customer retail experience and marketing to women and an AdAge Power 150 Marketing Blog. She also writes the Simple Marketing Blog, a Junta42 Top 42 Content Marketing Blog and contributes to MarketingProfs. 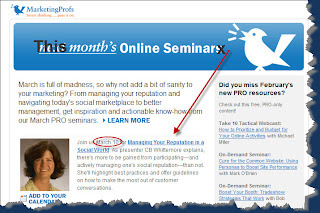 To attend the March 10th MarketingProfs online seminar “Managing Your Reputation in a Social World”, register by visiting http://www.marketingprofs.com/marketing/online-seminars/346. The event is free for MarketingProfs Pro members and $129 for non members. MarketingProfs is a rich and trusted resource that offers actionable know-how to help you market your products and services both smarter and better. Entrepreneurs, small-business owners and marketers in the world’s largest corporations make up its383,000 subscribers, making it the largest in its category. Through the MarketingProfs Web site, newsletters, conferences, seminars, forums and so on… we help you navigate your way to market your business and keep you informed of the newest and best tools. Think of us as a beacon of light illuminating the path through the clutter. For more information, visit http://www.marketingprofs.com/. Happy March! In honor of the snow melting in Northern New Jersey and Spring officially springing in just a few weeks, I have a special treat for you! A record number of marvelous links and resources shared on Twitter and tagged #practicalmktr grouped here together in Practical Simple Marketing In The News.